E.D. Hill: Well, we’ve got our hands full both in Iraq and Afghanistan and our next guest says that Iran sees that as an opportunity to exploit. 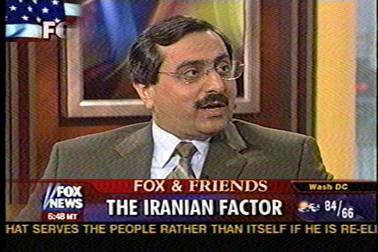 Judge Andrew Napolitano: With us is Alireza Jafarzadeh, President of Strategic Policy Consulting and a Fox News Foreign Affairs Analyst. Judge Andrew Napolitano: What should we be worrying about from Iran today? Alireza Jafarzadeh: Well, I think we should be very concerned about what agenda 1ran has, which is erecting an Islamic Republic in Iraq modeled after Iran. They want to do exactly the same thing they have done to the Iranian people and they are doing every effort to accomplish that. They are sending their Ministry of Intelligence agents, their Revolutionary Guards, the special force known as the Jerusalem Force, they’re sending arms, they’re funding a lot of these groups in Iraq. They have sent thousands of clerics who are involved in the rabblerousing in Iraq. And they have every interest to see an increase in instability and violence in Iraq because the more violence and instability, the more those who have the guns and the money and the network can dictate. And that’s exactly what they want to do. E.D. HILL: I had been under the impression that Iran itself was a little on the brink; that the unrest there could undo their political structure. Therefore, I was kind of surprised that they would have the ability to go in and cause that much trouble in Iraq or is it because of that, because of the instability in Iran that they are desperate to make sure that the Iranians can’t see a free, democratic Iraq? Alireza Jafarzadeh: Exactly, to the contrary if they succeed, meaning the Iranian mullahs can establish an Islamic Republic in Iraq, that would be like a guarantee for their own survival, because they can exert their hegemony in the region and expand to other countries. In the past 20 years they have thrived thru exporting crisis. Judge Andrew Napolitano: What does the U.S. do? We can’t feasibly seal off the border between Iran and Iraq, do we destabilize the Iranian government. Do we give strength to these nascent movements for democracy? And hope that might triumph? What do we do? Alireza Jafarzadeh: I think the United States can do a combination of all of that. First of all in terms of the borders; the borders can be sealed, when you send a strong and decisive message that anybody who is caught crossing the border we’re going to hold them responsible. So far it’s been a very porous border, and they were coming in at ease. Second, I think that both the Iraqi intern government and the United States should take the fight into the Iranian regime’s turf and beat the Iranians at their own game by expressing support, stepping up support for the organized opposition. 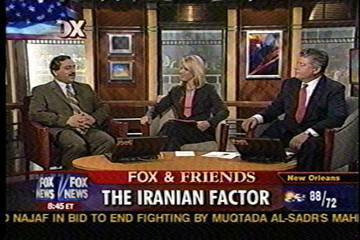 Interestingly there is a large force of Iranian opposition, some 4,000 of them in Iraq known as the Iranian Mojahedin who are anti-fundamentalist Muslims who are vehemently opposed to Tehran, who have a good relationship with the United States, and are very supportive of Iraqis, who can play a big role of both sending a political message and also playing a role in bringing about change there [in Iran]. E.D. HILL: One of the troubles we are seeing here at home there is a presidential election going on and just because you got to present an option if you are running against the incumbent. You know John Kerry has said I believe just last week, I’m going to start pulling troops out of Iraq someone would argue then you are giving folks like those in Iran who want to destabilize Iraq further more of a reason to do it. Alireza Jafarzadeh: I’m sure the realities on the gourd will dictate to any president who is in the office, but certainly one thing you don’t want to do, even during the campaign, is to send a signal of weakness and indecisiveness to make them think that there is a window of opportunity for them and more room for them to maneuver. Alireza Jafarzadeh: Thank you E.D., thank you Judge.